I LOVE these maps! What talented young artists you have. I made a pirate kit a year or two ago for one of my daughter's friends. It was a small wooden chest that I painted and distressed and filled with large glass stones, a few fake diamonds from the craft store, an eye patch, a bandana, a bunch of wooden coins of different sizes that I found as blanks and painted gold, silver, and copper, and a treasure map. I made his by printing one out from the internet on iron-on transfer paper and ironing it to a piece of tan felt, cut the edges so they weren't perfectly even, rolled it up, and tied it with a ribbon. I USED to be happy with it, but now I see that it was not nearly as cool as I thought it was. 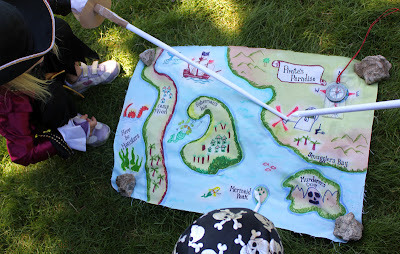 When we make a treasure map for us, it will definitely be with your method. Thanks for sharing! Looooove it! And the girly bandanna skirts too! LOVE the skirt esp. somehow I missed that post but will have to look it up soon! I just went back and reread the bandana skirt post. Wonderful. I wish I could get my daughter to be interested in wearing skirts! Amazing! 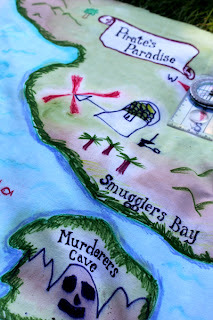 I'm planning a pirate birthday party and will definitely we using this idea! what a great idea! we soaked paper in coffee to create a weathered look, but the cloth is way better and more play-friendly! I've been following your blog for about two years and this is the first time I've commented (I think.) I love your blog and your husbands. You guys are so clever! So futher to the point...this is really random, but just about 10 minutes ago one of my great friends put on a Facebook request for used icecream pails. I have no idea what she is using them for, but my mind went insane. And I felt like I needed to share this insanity. Halloween Costume? Building blocks? Craft Supply Holders? Toy Holders? Barbie Bungalow? Lego Holder? Storage Units? Crayon Holder? Marker Holder? Gift Wrapping? Nuts and Bolt Holders? Xena Gauntlets? String of Lights Holder? Piggy Bank? Lunch Box? Purse? Hair Accessories Box? Jewelry Box? Jewelry? Doll House? Boat? Squirrel Coffin? Binoculars? Underwater Mask? Shoe Box? Laundry Sheet Holder? Kleenex Holder? Hat? Shoe Spats? Pond/Puddle Spyglass with Cellophane Bottom? Cord Holder? Fruit Bowl? Veggi-bowl? Planter? Aquarium? All I know is that with some scissors and paint you could have one fun time with those containers. Either pint, quart, or gallon. I'm a semi-crafty 25 year old mama of two boys, four and two, who constantly keep me on my toes. The changing financial times have necessitated that Hubby and I move back in with my fifty-something mother, so my projects - as sold online in my store and for the boys - need to be relatively easy to move around, easy to clean up, and easy to pack back away if possible, while still being engaging enough to keep their attention for me to, you know, do dishes or wash laundry. Your blog fits the bill for ALL of those things, and I freaking love it. Great idea. 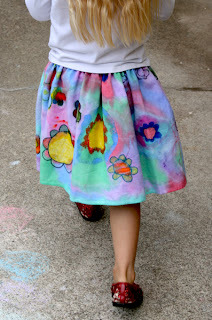 My son would love this project--and I've been wanting to do the DIY painted skirt since I saw that post. 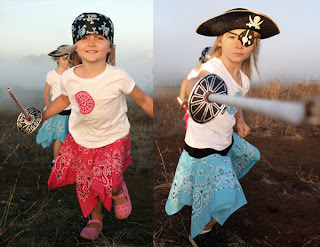 I love your pirate skirt and it is so easy to make, I have made several for my great nieces and now the teenagers all want me to make them one, however to get the length they need I am going to have to layer the bandannas and I so far have not figured out how to do that properly. Any suggestions?